Part of the Cool Sites series! We learn through the process of storytelling. Stories give learners a context for knowledge gained and a way to visualize concepts and ideas. Educators can use storytelling to teach any subject and engage students. In addition, teaching our learners to be great storytellers helps give them confidence because they are allowed to be creative and share a part of themselves. In their stories, they can always be the hero. Below are a few online tools and mobile apps to help your learners create digital books. There are 100s of digital storytelling tools and apps I have written about here, but in this post I am focusing on tools in which you create digital books. Storybook apps and tools make it possible for learners to share a complete narrative. Storybook creation tools tend to be very easy to use and are a safe way to publish work online, since students usually contribute only text and images. Check out my recent webinar recording filled with lesson ideas. Below, I have included the slide presentation. In future posts, I will share tools for creating stories with video tools and multimedia apps. Zooburst- My favorite storybook creation tool. The web tool is absolutely amazing and fantastic for students to create online 3D pop-up books they can embed, add their own photos to, and create written dialogues for. They can interact with their story using the Augmented Reality option. The free iPad app allows students to read the stories made and students scan Zooburst Story Codes to read the digital story made online. Little Bird Tales- Students can draw their own art or upload images to create a book where they add their voice and text to narrate their story. Then they can embed, create PDFs and MP4s of their stories. Available for i-devices for $2.99 but the web tool allows for the creation of free stories. Storybird-Perhaps the easiest storybook creation tool! Students create beautiful stories by choosing beautiful art and adding the words. Embed in a blog or wiki. Kerpoof- Create a story with a template. Students choose what kind of plot line then choose from a variety of characters. Also has options for creating a movie, drawing a picture, or making an ecard. Picture Book Maker- Create a beautiful children’s book by choosing characters and props and creating the text. The end product looks like a real book that children can order. Simple Booklet- Create flip books with beautiful images and text. This is more ideal for teens to adults. No registration required. Dr. Seuss Story Creator- Choose music, text, backgrounds and feature some of your favorite Dr. Seuss characters. Pinky Dinky Doo- For kids. Children pick what kind of story to create then they fill in gaps in a story that has characters and a plot line. Storymaker by British Council- This is more of a story generator. Students get to choose the type of story then choose various elements of a story that has already been created. Storypanda- Features books with tap, swipe, and drag. Choose backgrounds and characters, etc. 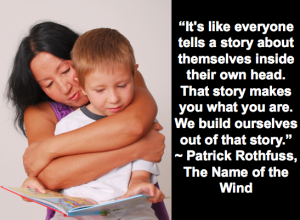 Kids can place themselves into the story or create their own stories. StoryKit- Create an electronic storybook by drawing on the screen, uploading images, recording sound effects and voice, laying out the elements of the story (text boxes, images, paint, and sound clips) freely by dragging them or pinching to resize, reordering pages, and uploading to the StoryKit web server. Email a link to the story. The application includes four public domain children’s books to rewrite and rearrange into a new story. Available on the iPad and iPod. StoryBots- create books on the iPad starring the student! The app is free for the iPad. Includes animations and art. Various options to purchase the book. Bunsella Bedtimes Story- students narrate a children’s story, can upload personal photos that become part of the story, then email the video of the narrated story. Others can respond to these read stories. Available on i-devices. Mooklet for iPhone- create photo stories with text.